Leslie Ambrose (Joe) Bush was born on November 27, 1892, the third of seven children of John William "William" Bush and Margaretha "Maggie" (Wieshalla), of Gull River, Cass County, Minnesota. John William, originally from Ohio, was a conductor with the Northern Pacific Railroad. Mother, Maggie, was from Dziekanstwo, Poland. Joe's formative years were largely spent in the nearby town of Brainerd, where his family resided in a tiny frame house on Fir Street that still stands, and where he attended high school starring in football and baseball.2 It is noteworthy that Hall of Famer Chief Bender - Bullet Joe's teammate with Connie Mack's Athletics- was also a Brainerd native. A November, 1974 article in the Crow Wing County Review by Brainerd historian, Dr. Carl A. Zapffe, described Brainerd as a "baseball-conscious town," erecting a ball park in the very center of the village before many of the city streets were formed. He tells the story, as told to him by a former Joe Bush Brainerd teammate, Louis Imgrund, how Joe would practice his pitching in an old orchard by throwing "exceedingly-fast rotten apples" at the crescent-shaped hole of a neighboring outhouse. A direct hit meant considerable spray spattered throughout its interior, particularly annoying to anyone seated there. According to Imgrund, Joe "rarely missed." Brainerd was at the geographical center of Minnesota, populated by railway centers and mills, and was a gateway to numerous lakes and deep forests ideal for sportsmen's pursuits. This lifestyle was influential on young Joe Bush - an avid hunter and outdoorsman - who was later a regular participant in sharpshooting events and hunting excursions, often with such gun-toting baseball cronies as Eddie Collins, Mickey Cochrane, Eddie Plank, Walt Huntzinger, and Sad Sam Jones. Bush's first important game as a pitcher was in 1911. "I won my spurs as a pitcher," said Joe, in relief against a St. Cloud team. Bush said that he had relieved "an Indian pitcher" who had been hired by Brainerd to play professionally for them.5 He struck out 11 men that day, won all of his starts that summer, and never looked back. Hugh Campbell, president of the Missoula, Montana, club of the Union Association (Class D) - upon advice of a friend who spotted the young Brainerd phenom - signed Joe to a contract for the 1912 season. Cliff Blankenship, an ex-major leaguer, then catcher-manager for Missoula, took Bush under his tutelage and helped him with the "rudiments of pitching," said Joe. Blankenship had earlier helped land the great Walter Johnson after a scouting mission for the Washington Senators. An April 1914 article in the Philadelphia Inquirer reported in great detail Bullet Joe's experiences hunting and trapping deep in the woods of northern Minnesota in the fall of 1913, following the World Series that year. His guide and companion was Henry Thunderclap of the Red Lake reservation, who was Bush's teammate on a "little team" at Cass Lake, Minnesota when - it is likely - Bush first started in organized ball. As the article describes, young Bush, with the help of his Indian teammate, "put it over their opponents in good style." Most baseball record books regularly list Bullet Joe at 5 feet 9 inches tall. However, photographs of him standing next to players who, with more than a degree of certainty, were known to be 6 feet or better is persuasive that Joe's height was probably closer to 6 feet. He is, in fact, listed on the Philadelphia A's 1928 roster as 6 feet tall and 185 pounds. He threw with great velocity and was generally compared with the best speed-ball pitchers of the day, second only to Christy Mathewson according to Connie Mack. He had a very good curve ball, and would later develop a forkball when arm trouble made throwing the curve more difficult. Although not the first to throw the unusual flutter ball, Bush would be credited as one of the earliest major leaguers to popularize the delivery, throwing the pitch with consistency and effectiveness. Some say he "invented" it, including Joe, himself.6 Others are usually credited with that distinction. Bush had a few idiosyncrasies, as well, in his pitching delivery: he threw every pitched ball with such intensity that he emitted a "grunt" sound "that could be heard in the bleachers. "7 He had a pirouette style of delivery called the "Joe Bush twist-around" pitch that Babe Ruth considered quite effective. Ruth encouraged other young Yankees pitchers to mimic the style. In the articles written with Carroll Slick for the Saturday Evening Post, Bush described his pitching style when he first arrived in Missoula as "depending on speed alone to win." Blankenship took him under his wing and taught him how to pitch. It was effective. Missoula won the Gladsome Rug, emblematic of the Union Association championship, with an 83-51 record. Bush posted a league-leading 26-16 record, a winning percentage of .619. The nickname "Bullet Joe" took hold in Missoula. The club president, Hughie Campbell, began to call him Joe Bush after a former local bronco buster. Later, the local media began to call him Joe Bullet, because of the speed of his fastball. Bush credits the nickname - Bullet Joe - to later Philadelphia teammate Eddie Collins, who applied the label after observing a letter in the clubhouse that was addressed to "Joe Bullet" Bush. The nickname stuck for the rest of his baseball career. Upon the advice of Blankenship, Connie Mack, distinguished gentleman, part-owner and manager of the Philadelphia Athletics, purchased Bullet Joe from the Missoula team on August 20, 1912. He made his debut with the A's on September 30 against the New York Highlanders, a game the A's won in 11 innings, 11-10. Bush pitched eight innings, yielding all 10 runs and giving way to future Hall of Famer Stan Coveleski, who got the win in relief. This was Bush's only appearance in 1912. Mack's star pitcher, Jack Coombs, fell ill in 1913 and missed most of that season. This unfortunate turn of events for the A's proved fortuitous for Joe Bush, who was called on to be an "added starter" for Mack, and he fulfilled the role nicely, winning 15 of 21 decisions in the regular season. "Bullet Joe Had Meteoric Rise," proclaimed The Sporting News describing his rapid ascent from an obscure minor league team to sudden fame, in 1913, after Bush shut down the New York Giants in the third game of the World Series.8 At 20, he was but a lad, one of the youngest to play in a World Series at that time, but he stemmed the momentum of a New York team that had defeated the Mackmen, 3-0 in 10 innings, at the hands of Christy Mathewson the day before. The A's went on to win that Series, four games to one. Though he had an illustrious 17-year major league career, young Joe's victory over the Giants in 1913 - early in his career - would be one of only two victories in his seven World Series' decisions. He would long share the dubious distinction of five World Series losses with future Hall of Famers Christy Mathewson, Rube Marquard, and Eddie Plank, a record eventually surpassed by Whitey Ford of the Yankees in 1963. Ford would lose eight Series games, along with his ten victories. But Bullet Joe's World Series losses are distinguishable from the others; his five losses were consecutive, a record that still stands. Bush had another good year with the Athletics in 1914, winning 17 games and losing 13, with a 3.06 ERA. As part of a strong staff with Chief Bender, Eddie Plank, and Bob Shawkey, he led the team into the 1914 World Series against the "Miracle Braves" from Boston, who rose from last to first place in little more than seven weeks, passing the New York Giants for keeps on September 8. If the 1913 World Series was a crowning achievement for Bullet Joe, it was the opposite for him in the Series of 1914. Once again he was given the pitching assignment for Game Three, but this time the result was different. The A's lost the first two games in Philadelphia. The third and fourth games were played at Fenway Park - the home of the Red Sox - due to the run-down condition of the Braves' home field, the South End Grounds. Bullet Joe's pitching heroics in the 1913 World Series had buoyed his team to a championship. But his misplay in the 1914 Series helped lead to their downfall. Bush had pitched well and was locked in a duel with Lefty Tyler through nine innings, knotted at 2-2. Both teams scored two runs in the 10th. Then, in the 12th inning, Hank Gowdy, a .243 hitter during the regular season, but a .545 hitter in the Series, stroked a double. After an intentional walk to Larry Gilbert, the next play was a sacrifice bunt by Herbie Moran that Bush threw past third baseman Home Run Baker, allowing the winning run to score. The A's were crushed. The Braves won the fourth and final game by a score of 3-1, and made a clean sweep of Connie Mack's nine. The next day's October 13 edition of the New York Times reported that both starting pitchers in Game 3 had pitched with aplomb and neither team would give an inch, but the mood changed suddenly for the A's when Bush made the errant throw, ending the game in defeat. The Times described the misplay as "fraught with tragedy" and it went on: "Then, by one tragic throw, he had knocked the foundation from under the Mackian machine and it came tumbling down in ruins." Bush was inconsolable as he slinked away under the stands toward the clubhouse with tears in his eyes as the crowd roared its approval of the Braves' victory. Not even Connie Mack could comfort him. After the 1914 World Series Connie Mack began to dismantle his club selling off star players rather than compete in a bidding war with the Federal ("Outlaw") League. Future Hall of Famers Eddie Plank, Chief Bender, Eddie Collins, and Frank "Home Run" Baker were not with the Athletics in 1915. Former ace pitcher Jack Coombs signed on with the Brooklyn Nationals for the 1915 season. Other prominent players like Bob Shawkey, Boardwalk Brown, and Jack Barry of Mack's "$100,000 infield" fame would soon follow, through trades to other clubs. Joe Bush would find little support from the fractured ranks of a team that bore no resemblance to the great Athletics teams of years past. The A's were woeful, plummeting from first place in 1914 to last in 1915, finishing 58½ games behind the American League leader, the Boston Red Sox. Bush won five games and lost 15 with a 4.14 ERA that year. The same ineptness that characterized the A's in 1915 continued in both 1916 and 1917. The A's lost more than 100 games in 1915 and 1916, and nearly as many in 1917, dropping 98 and finishing 44½ games behind the leader, the Chicago White Sox. In 1916, the A's lost 117 games and, astonishingly, they finished 40 games behind the seventh-place finisher, Washington. The A's held the record for most losses in a single season by an AL club for 87 years, until 2003, when the Detroit Tigers dropped 119 games--though the A's winning percentage is still the worst of any major league team since 1900. Despite little run support and a poor defense behind him, in 1916 Bush still won 15 games, while losing 24. He put together a remarkable 2.57 ERA, striking out a career-high 157 batters, yielding 222 hits in 287 innings pitched, including eight shutouts and 25 complete games. In 1917, he improved his ERA to 2.47, despite an 11-17 won-loss record. What made Bullet Joe's feat more remarkable was that he had pitched against the same Cleveland team the previous day, and was soundly beaten. He was disconsolate over the loss and his poor performance, and persuaded manager Mack to let him pitch the next day to redeem himself. Mack had few options besides Bush, so he agreed to the proposal. Another hallmark event that day: It was the last major league game played by future Hall of Famer Nap Lajoie, Connie Mack's second baseman that year. Cash-strapped Connie Mack dispensed with three more members of his once-great teams on December 14, 1917. He dealt Bush, Wally Schang, and Amos Strunk to the Boston Red Sox for three undistinguished players, and $60,000. All three ex-Athletics would contribute to the Boston ballclub in their run for the pennant in 1918, especially Joe Bush. Bullet Joe managed a 15-15 won-loss record in 1918, but with a career-best - and team best - 2.11 ERA, a career-high 26 complete games, including seven shutouts and a team-high 125 strikeouts. Bush, Babe Ruth, Carl Mays, Sad Sam Jones, and Dutch Leonard formed a strong pitching corps that led the Red Sox into the 1918 World Series, which the Sox took in six games from the Chicago Cubs. Bush appeared in two games in the 1918 Series. He lost Game Two, a well-pitched 3-1 contest, and saved a win for pitcher Babe Ruth in Game Four. The following year was a difficult one for Bullet Joe, who developed arm trouble and remained out of action most of the season. It was also not a good year for the Red Sox. They finished sixth. It appeared that Bullet Joe was all but washed up due to the injury, but his toughness and indefatigable spirit sustained him and pushed him to a comeback with the Red Sox in 1920. Essentially, he reinvented himself, coming up with a new pitch - the forkball - that enabled him to pitch another nine years in the big leagues. In the Saturday Evening Post series, Bush described his "invention" this way: "Probably one of the most bewildering balls ever pitched was my own invention - the fork ball, which I discovered in 1920 when I was essaying a comeback with the Boston Red Sox after I had hurt my arm several years before and was forced to stop throwing curve balls. "11 Though Bush claimed arm trouble of "several years" duration, there is no indication in the record that it pre-dated the 1919 season. 1920 was a comeback year for Joe, and he put together another 15-15 won-loss record. But the Red Sox bore no resemblance to the champions of 1918. Owner Harry Frazee had begun to dismantle his championship team at the end of the 1918 season. Once again Bush found himself on a team in the process of being sold off. The Red Sox were now mired in mediocrity, finishing 1921 in fifth place once again. Bullet Joe had a good year, however, with a 16-9 won-loss record and a 3.50 ERA, second-best on the team. He struck out 96 batters, second to Sam Jones, who had 98. He also hit .325 with 39 base hits in 120 plate appearances. Bush joined a strong Yankees club that had won the American League pennant in 1921, and would go on to win two more pennants and a World Series during his stay with them. Joe had a career year in 1922 with a team-high 26 victories, losing only seven, for the best winning percentage in the American League. The Yankees won the pennant with a 94-60 record, but then were swept in the World Series, 4 games to none, with a controversial tie, to McGraw's New York Giants. Bullet Joe started the opening and final games, losing both, by 3-2 and 5-3 scores. He had little run support from the team which had a combined .203 batting average. Babe Ruth hit an anemic .118 without a home run in the Series. Joe was embroiled in controversy during the Giants' Series-ending fourth victory. In the final contest, Bush and the Yankees were leading 3-2 in the eighth, but the Giants had men on second and third with two outs. Yankees' skipper Miller Huggins ordered Bush to walk future Hall of Famer Ross Youngs and pitch to High Pockets George Kelly. Bush became enraged at the proposal, shouting audibly at Huggins, but he complied with his manager's order, walking Youngs. Kelly then singled to center, scoring two runs. The Giants went on to win the game and the Series the next inning. Bush further distinguished himself in 1922 by halting the consecutive game hitting streak of future Hall of Famer, George Sisler, who had hit safely in 41 straight games. Bush stopped the streak on September 18. Sisler's AL record stood for 19 years until Joe DiMaggio eclipsed it in 1941, hitting safely in 56 consecutive games. The Yankees had another strong year in 1923, finishing in first place by 16 games over second-place Detroit. Joe Bush did not match his 1922 performance, but had a good year nevertheless, with a 19-15 won-loss record, a 3.43 ERA, and 125 strikeouts. The Yanks beat the Giants in the World Series this time, four games to two. Game One of the 1923 World Series was the first Series game to be played in Yankee Stadium and the first to be broadcast nationally. Bullet Joe pitched well in relief that day, but his World Series jinx continued; he lost to the McGraw nine, 5-4, when Casey Stengel hit an inside-the-park home run off him in the ninth. He came back in a crucial fifth contest with the teams locked at two wins apiece, however, pitching a masterful game and shutting down the Giants, 8-1. The Atlanta Constitution reported, "'Bullet Joe' Bush Baffles Sluggers of the McGraw Clan With Slow Fork Ball." The Yankees wrapped up the series by winning the next and final game, 6-4. The Yankees would not repeat in 1924, finishing second to Walter Johnson's Washington Senators, who won the World Series that year over the Giants, 4-3. On December 17, 1924, the Yankees traded Bush and two other players to the St. Louis Browns, obtaining spitballer Urban Shocker. This was a major disappointment for Bush, who had had three solid years with the Bronx-based team. The Yankees finished a dismal seventh in the American League in 1925, while the Browns finished third, though 15 games behind the leader, Washington. Bullet Joe compiled a 14-14 record that year, with 63 strikeouts, but had an unimpressive 5.09 ERA. He pitched two shutouts, one of them a splendid one-hitter on August 27 over Walter Johnson of the American League champion Washington Senators, 5-0. Johnson got the only hit off Bush, a double in the sixth inning. Harris's predictions for Bush did not play out. On April 18, Joe was hit on the knee by a vicious drive off the bat of New York's Earle Combs. Bush had pitched one-hit ball - a double by Lou Gehrig in the sixth - before he was struck by Combs' shot in the top of the ninth. He was slow to recover, and was never able to regain form with Washington, posting a 1-8 won-loss record. Ever a man of action, Bush immediately made arrangements with a semipro club - the East Douglas, Massachusetts team of the so-called "Millionaire League" - to play for them. He did play - one game. On June 29, 1926, Bush pitched a shutout over a local Worcester team. The next day, he signed to play for another contender, the reigning World Champion Pittsburgh Pirates. He was back in the majors. Joe's performance with Pittsburgh was more than respectable. The Pirates were in a pennant race and Bullet Joe was being counted on to bolster the staff. He was a contributor, as a pitcher and with his bat. Although his won-loss record was a mere 6-6, he finished with a 3.01 ERA, fanning 38 batters in 110 2/3 innings pitched, with two impressive shutouts, the second a two-hitter on September 20 against the Phillies. The Pirates were inconsistent as a team, however, and finished third, 4½ games behind the first-place Cardinals. Bush was on the Pittsburgh roster at the outset of the 1927 campaign, but his tenure with them was short-lived. New Pirates manager, Donie Bush, a take-charge guy, sensed a pennant was possible, but knew he would need to shore up his pitching staff if he was going to win. Joe Bush was not in his plans and received his unconditional release from the Bucs on June 15. The Pirates won the NL pennant that year, but lost to the Yankees juggernaut, led by Ruth and Gehrig, in four straight games. Bullet Joe appeared in seven games for Pittsburgh in '27, used as a pitcher and pinch-hitter. He was the starting pitcher in three games, won one and lost two, with an unimpressive 13.50 ERA. Once again Joe was on the outside looking in. But an old opponent, John McGraw - the victim of Bush's heroics in the memorable 1913 World Series - was in need of pitching; he threw Bullet Joe another lifeline, signing him to a contract with the Giants on June 29. But Joe lasted barely long enough to dirty his uniform. He pitched in three games - starting two - beating the Boston Braves on July 2, 4-1, with an impressive seven-hitter; but getting bombed by the Brooklyn Robins on July 9, giving up seven hits and four runs in the first inning. He was released by the Giants on July 19. Wasting little time, in late August, Bush joined the Toledo Mud Hens of the Double A American Association, led by manager Casey Stengel. Stengel put together an assemblage of major league cast-offs for a stretch run at Toledo's first pennant. Bullet Joe "turned in four important victories," according to the New York Times.16 Toledo won the pennant and went on to win the Little World Series championship, 5 games to 1, over the International League's Buffalo Bisons. Bush pitched and took the one Toledo loss. On December 7, Toledo released Bullet Joe, and later its other veterans, Irish Meusel and Everett Scott. 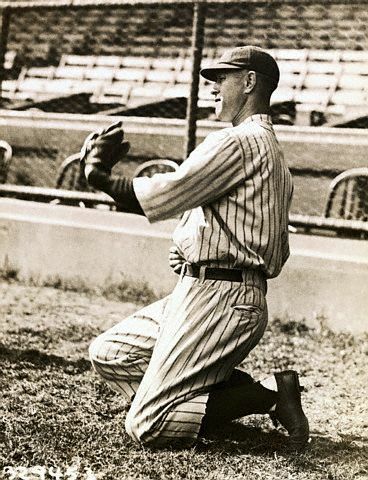 Joe's resiliency in always landing on his feet emerged again when, in late December 1927, Connie Mack signed the 35-year old veteran to a contract with the Philadelphia Athletics. Bush joined a star-studded team that included Ty Cobb, Tris Speaker, Eddie Collins, Mickey Cochrane, Lefty Grove, Al Simmons, and Jimmie Foxx. They finished second to a strong Yankees team that swept the St. Louis Cardinals in the 1928 World Series. Bullet Joe was used sparingly by Mack, finishing with a 2-1 won-loss mark. Sportswriter Frank Young of the Washington Post reported that Bush's role on the A's was largely one of fungo hitter most of the season. Joe was waived - along with Ty Cobb and Tris Speaker - by the A's on November 3, 1928, and later released. It was the end of his major league career. In 1929, Bush signed on with the Portland Beavers of the Pacific Coast League as an outfielder. He was released on May 25, and promptly went back to the East Coast, joining player-manager Tris Speaker and his Newark Bears of the International League, on June 17. There he was used in utility roles and pitched, finishing with a 3-3 won-loss record. On October 23, 1929, the stock market collapsed, leading to the Great Depression. Baseball was affected, especially the minor leagues, which lost three leagues almost immediately following the crash, and others later. But Joe Bush once again demonstrated the adaptability that was becoming legendary when he surfaced again, in 1930, by getting a player-manager position with the Eastern League's Allentown team. Frank Young of the Washington Post described Bush as "a high powered salesman" because of his ability to secure desirable posts when none appeared likely. Allentown won the 1930 Eastern League championship on September 22, beating Bridgeport, four games to one. Bush stayed with the team for the 1931 season but it finished a mediocre fifth, 34 games out of first. Bullet Joe finished his baseball career in 1932 pitching for the Kentucky Colonels of New York City, a semipro club. Leslie Ambrose "Bullet Joe" Bush was in organized baseball from 1906, it is believed, through 1932. He played 17 years in the big leagues, from 1912 until 1928. During his major league career he won 196 games, lost 184, struck out 1,319 batters, and posted a quite respectable 3.51 lifetime ERA. He pitched 35 shutouts, including a no-hitter. Bush was also a well-respected batsman and was used often as a pinch-hitter. He once pinch-hit for future Hall of Famer Joe Cronin in a 1926 game with Pittsburgh. Bush's lifetime major league batting average was a solid .253 with 313 base hits in 1,239 at-bats. Aside from Joe's well-known baseball talents, he was a man of some creative expression as well. As was true with many ballplayers of the period, on occasion Joe would participate in vaudeville skits - usually with other ballplayers. He was described as having an "excellent baritone voice." Joe also was a ventriloquist. On one occasion when he was with the Red Sox, traveling north from spring training with the Giants, Joe got himself into some trouble with the locals in the small town of Morristown, Tennessee. While in a restaurant there, he began to mimic animal sounds that could be heard coming from different parts of the room, alarming the restaurant staff. They called the local constable, who arrested Joe. As the story goes, Joe then mimicked the sound of a vicious barking dog projecting his voice behind the constable, and while the officer turned to protect himself, Joe broke free. Bush's draft registration card, signed by him in April, 1942, lists an employer, the A. Overholt & Company of Philadelphia, PA. It is believed they were in the bituminous coal business. And then, a footnote in the March 11, 1943 edition of The Sporting News found Joe working as a timekeeper in a Philadelphia shipyard. Later, while attending a Yankees 25th reunion in June, 1948, Bush informed New York World-Telegram reporter, Lester Bromberg, that for the previous five years he had been working "a politician's job" for the Bureau of Recreation in Philadelphia. In his later years Joe Bush and his wife, Alice Marie Wray Bush, whom he married November 6, 1937, had a home in Fort Lauderdale, Florida, where they resided only part of the time. Beginning in 1946, Joe kept active from 11 a.m. to 7 p.m. as a pari-mutuel clerk working at New Jersey and Florida race tracks, notably the Garden State, Atlantic City and Hialeah, Florida. "I'd rather have too much rather than not enough to do," he once said to a sportswriter. According to his obituary he worked at the tracks "well into his seventies." Joe remained active throughout his life participating in numerous recreational pursuits. In September, 1958, Joe informed sportswriter Tom O'Reilly of the New York Morning Telegraph that he had sustained a heart attack the previous year causing him to give up bowling, a favorite pastime. During an interview in 1967 with sportswriter Bill Duncan of the Courier-Post, a Cherry Hill, N.J. paper, Bush described his "biggest kick" in baseball was picking off Ty Cobb at second base with the bases loaded. "Man, but he was furious! He pawed and kicked and howled at the umpire. It is a picture I'll never forget," said Bullet Joe. 2 From records of: Crow Wing County Treasurer, Brainerd, MN, and Cass County Treasurer, Walker, MN, Cass County Birth Record Book, Book D, p. 259, Line # 424; Lane, F.C., "The Yankees' Pitching Ace." Baseball Magazine, February 1923, p. 395-396. Bush was popularly known as "the Brainerd Boy" - referencing the town of Brainerd, MN - where he played high school and town team ball; According to the 1901-1902 Brainerd city directory, the Bush family resided at 907 Fir Street in Brainerd (Crow Wing County). Thus Brainerd was Joe Bush's actual place of residence during his formative years. Evidence is persuasive, however, that Joe Bush was born in Cass County in an area known as Gull River - possibly a village or township - several miles west of Brainerd. 3 1910-1911 Brainerd City Directory, shows Leslie Bush employed as a "driver" for Hutchins Laundry on 719 Broadway in Brainerd. He would have been somewhere between age 17-19 at the time, when he was also playing ball for the local town team, the Brainerd Baseball Club. 19 Obituary from Brainerd Dispatch, November 1, 1974; Censuses for: Brainerd, Minnesota, Crow Wing County, 1900 and 1910; Abington Lower District, Pennsylvania, Montgomery County, 1900. Moreland Township, Pennsylvania, Montgomery County, 1910; Philadelphia, Pennsylvania, 1920 and 1930. Unsigned article. "Cupid Strikes Out 'Bullet Joe' Bush." Philadelphia Inquirer, October 11, 1914, p. 3. Bush was to have married 18-year old Sylvia McMahon, a "remarkably pretty girl," described the Philadelphia Inquirer, on October 14, 1914. That was two days after he pitched in Game Three of the WS against the Boston Braves. Various censuses support that Bush was married to Sylvia until at least 1930. There is no information on wife Sylvia after 1930. Bullet Joe married Alice Marie Wray on November 6, 1937.